Hello Friday! I'm headed back to my stunt sewing roots this week. 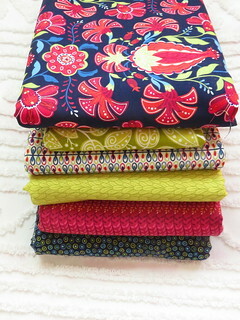 Alex called me and asked if I wanted to make a bag for the quilt market display of her new fabric line Mirage with RJR. YOU BET. Sewing with a purpose is my favorite kind of sewing. 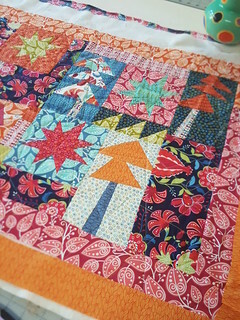 I love the big focal print, it begs to be fussy cut. So I did, for a tote bag. I'll show you when I finish it up. I have some perfect green handles the will go great with it. Mirage ships in March/April. 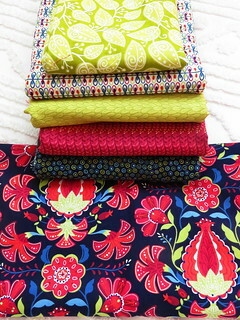 Quilting in the Garden was a couple of weeks ago and Alex took a class from Freddy Moran and used her Mirage advance yardage for this fun Freddie style quilt. Don't know Freddy? Just google her name and you'll see a slew of amazing quilts. She's truly a quilting legend. 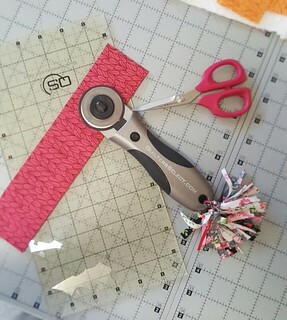 Alex also showed me her latest rulers, mats and rotary cutters from Quilter's Select. That cutter is pretty amazing. I love the soft gray of the mat, nice and neutral.